To order a printed copy of the Vodkatrain - Trans Siberian Railway & Silk Road brochure, simply click the Request button below. 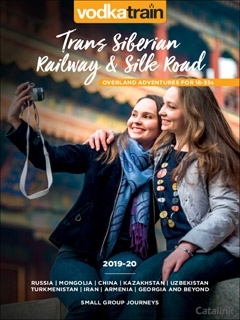 You can download the Vodkatrain - Trans Siberian Railway & Silk Road Brochure instantly as a digital iBrochure [?]. View the Vodkatrain - Trans Siberian Railway & Silk Road Online Brochure Now! Overland Adventures for 18-35 year olds! Vodkatrain is a journey for the curious, the searches and the seekers. It will not satiate your spirit of adventure but light a fire underneath it. Download or order their brochure today to explore all they can offer you! Are you ready to shed your comfort zone and dance in the face of the unknown? If you seek something different and love to grab life by the adventure, this is the place for you. With Vodkatrain you'll discover intriguing destinations, authentic experiences, helpful honchos, and so much more. Take an overland journey along the Trans Siberian Railway or trace the steps of the ancient traders on the Silk Road - whichever you choose, it's sure to be the adventure of a lifetime. Journey through a selection of incredible countries and take in their culture, delicious delicacies, marvellous locals and incredible sights. From China, Mongolia and Russia to Georgia, Armenia and Turkey - start your journey today! Order or download your free Vodkatrain brochure today and start planning an experience you'll remember for years to come! Vodkatrain - Trans Siberian Railway & Silk Road Brochure Dianna W. said: Exciting brochure alas to old! By pressing the Request Printed Brochure button you give consent to Vodkatrain - Trans Siberian Railway & Silk Road (and their Data Processors for the specific purpose of delivering your literature) to send you their Brochure .